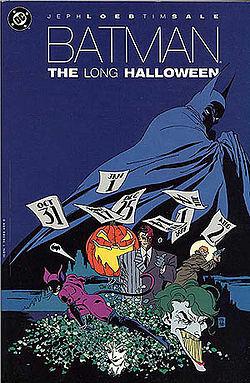 I know this came out in the 90s, and it is referenced constantly, and everyone and their grandmother already knows how great it is, but The Long Halloween is really, really good. This events of this novel take place relatively early in Batman’s career, having worked with Lt. Gordon for some time but with a seemingly new relationship with DA Harvey Dent. There is a turf war between two rival crime organizations, and Gordon and Dent are struggling with how to best deal with these threats. Dent and Batman try to take matters into their own hands, but the gangs find out that Dent is involved and blow up his house, injuring himself and his wife. Afterwards, a mysterious vigilante kills one the villains on major holidays, carefully leaving themed tchotchkes at the scene, and thereby earning the nickname the Holiday Killer. Throughout the ensuing years, the reader sees many of the regulars from the Batman universe including the Joker, Catwoman, and a host of other at Arkham Asylum and out in the wider world. The killer(s) are eventually revealed, but the book builds the tension towards the ending, where Two-Face is introduced. The story itself is set up cleverly, with each individual episode built around the given holiday and associated murder, making the passage of time easier to follow than it is in some novels. This book is great not only because it is a well written Batman story, but also because it is a pretty good murder mystery as well. It has a lot of atmosphere, and gives some great backstory for both Dent and Batman, particularly with the relationships he develops with others. I am going to seek out the sequels written by Loeb and Sale, as this might be one of my favourite superhero graphic novels ever. I read the first four novels in this series in a row this summer, and now I can’t really distinguish between the four of them.It’s not that they weren’t good or deal with specific events, but more that the storyline flows fairly seamlessly amongst the series. Maybe this will teach me to write reviews on an ongoing basis rather than waiting months to complete them. Probably not. Naomi Novik has published seven books in this series, and I have thus far read His Majesty’s Dragon, Throne of Jade, Black Powder War, and Empire of Ivory. My brother in law lent them to me last year, and I put off reading them, because seriously? A series about the Napoleonic wars, but with dragons? This summer, I picked up the book on top of my reading pile, and it was the collection of the first three novels. Not being a particular fan of historical fiction at the best of times, I was kind of dragging my feet on reading them. However, one chapter turned into four books fairly quickly, although after the fourth I did need to switch gears a little. In short, the books are set during the Napoleonic wars, and focus on the English military, which encompasses an aerial division consisting of very intelligent dragons and their human crews. 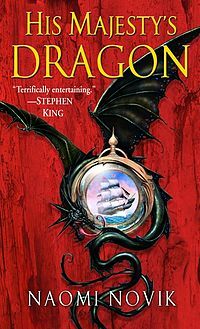 The reader largely follows a naval captain who is forced into service when a dragon egg hatches on his ship, and adventure inevitably ensues. I think that part of the reason the books were so readable was because they were not wink-wink nudge-nudge about the inclusion of dragons in this otherwise traditional historical fiction. It makes it easier to invest in the story, although I was pretty skeptical at first. In the novel, dragons are part of the military, and there is an entire, virtually hidden structure built around raising and training them in England. As the novel progress, Captain Laurence and his dragon companion Temeraire travel to other parts of the world and it is made evident how dragons are included in different societies throughout the world. In China, they are distinct classes of dragons, with cities built to accommodate their participation in daily life. In Africa, they revered as ancestors and leaders. In England, the citizenry is afraid of them and dragons are considered little more than animals, despite their obvious intelligence. These differences in which dragons are treated are obvious, and Temeraire is determined to advocate for dragons in his own country, although Laurence advises caution in a time of war. Laurence’s family is very wealthy and influential, and his father has been working for the abolition of slavery, which leads to some rather obvious parallels. Another reason the books are fun is that the female characters are generally kind of great – they serve in the aerial part of the military, without much of the public knowing, because one particular valuable breed of dragon will only work with female captains. Although the rest of the military and the public at large are aghast every time they realize women are in service, within the corps. itself the women are treated as are the male officers, without even blinking. While there are far fewer females in the service, they are in positions of command and there is no question about their capability from their coworkers. Laurence had grown up in a high society family and then worked for years in the navy, and has some trouble adjusting to the presence of women in the military. Women’s suffrage does not seem to be an issue in the book due to the time period, although as the presence of women in the military becomes better known in the story that might come forward earlier than it did in reality. After reading the books, I needed a change from the structured format of the novels. Historical fiction is not generally my area of interest, so all the battles and manners was wearying after a while. I do intend to go back and finish the series, though, as it is well written and kind of fun to read.